Start Your Journey™ Have you considered vaping as an alternative to your current lifestyle? Free Expedited Shipping to USA on orders over US$35.00! If you are underage and you place an order, you will lose your money, guaranteed. DashVapes now offers FREE world-wide shipping! Anywhere you are in the world, it's affordable to shop with DashVapes! DashVapes has announced their nationwide expansion in to British Columbia. We are pleased to introduce UPS as a method of shipping for your packages! The choice is yours between Canada Post and UPS. Switching from tobacco cigarettes to vaping products will reduce a person's exposure to many toxic and cancer-causing chemicals. As a step towards quitting cigarettes, many smokers may go through a transition period when they use both cigarettes and vaping products. Studies have shown short-term general health improvements in those who have completely switched from smoking cigarettes to vaping products. WHERE CAN I PURCHASE VAPE, E-CIGARETTE or E-JUICE? DashVapes is the largest online vape store in Canada serving Ontario, Quebec, British Columbia (Vancouver, Burnaby, Victoria), Alberta (Edmonton, Calgary, Red Deer), Saskatchewan (Saskatoon, Regina), Manitoba (Winnipeg, Brandon, Thompson), New Brunswick (Fredericton, Moncton), Newfoundland (St. John's, Conception Bay), Nova Scotia (Halifax, Cape Breton), Prince Edward Island, USA and Europe. 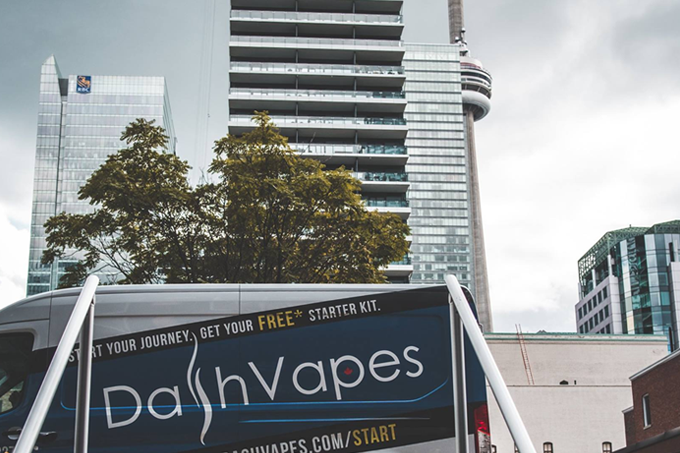 DashVapes serves the following local vaping communities in Ontario; Barrie, Innisfil, Wasaga Beach, Blue Mountains, Bradford, Collingwood, Markham, Concord, Mississauga, Woodbridge, Oakville, Brampton, Milton, Burlington, St. Catharines, Niagara Falls, Pickering, Durham, Scarborough, Oshawa, Whitby, Ajax, Courtice, Bowmanville, Richmond Hill, Vaughan, Stouffville, Aurora, Newmarket, Maple, Oak Ridges, Toronto, Downtown Toronto, North York, Etobicoke, The Beaches, East York, Yorkville, the Downtown Financial District, Peterborough, Port Hope, Lindsay, Kawartha Lakes, Bocaygeon, and Newcastle. DashVapes serves the following local vaping communities in British Columbia; Vancouver, Burnaby, Richmond, Coquitlam, and Abbotsford. WE ARE YOUR TRUSTED SOURCE OF ELECTRONIC CIGARETTES, ECIG AND VAPE MODS, ECIG LIQUID AND MORE. Are you looking for electronic cigarettes in Toronto? Look no further. In recent times, more and more people have sought an alternative to traditional cigarettes in the form of ecigarettes, which has led to an explosion in vape shops. Rising prices, stricter legislation, and shifting attitudes mean that safer, more people-friendly means of smoking are becoming more popular. An electronic cigarette (e cig or e cigarette), personal vaporizer (PV) or electronic nicotine delivery system (ENDS) is a battery-powered vaporizer that simulates the feeling of smoking. Their use is commonly called vaping, and vape shops commonly sell these devices in addition to accessories such as vape mods and vape liquid. WHY VAPE, BUY AN E-CIGARETTE, OR EJUICE? The reason our industry has become so popular is because it provides several advantages over traditional cigarette smoking. For one, you can smoke cleanly indoors in many places legally, while not bothering other people. Vapour does not have the same second-hand dangers as tobacco smoke does. And who can forget the smell? Nobody likes waking up smelling like an ashtray. With an e-cig, you won't ever have to wash your clothes three times just to get the stench out. Lastly, cigarette prices aren't going down any time soon. Vape liquid is affordable, long-lasting, and efficient, when compared to burning tobacco leaves. We offer a wide range of devices, including e-cig-a-likes (made to look like real cigs), E-cigarette starter kits, and more advanced kits for more serious vapers. We offer a wide array of purely authentic hardware, ejuice, batteries, and vape accessories from the top brands in our industry. You can shop online or find a DashVapes vape shop near you! We care about our industry, our customers, and our products. DashVapes as a company is built on strong ethics, from the products that we carry, to the service that we provide; rest assured you are only ever purchasing the absolute best the industry has to offer. We know what vapers need because we are them, we live our craft. Our approach is customer friendly, and borderlines on perfectionism. As proud supporters of advocacy, we are at the forefront of this movement, helping to change society for the better, one former smoker at a time. If you are in need of the best tasting, highest-quality e-liquids, or in the market for some top-notch new equipment, then we are here to help.